Venue Player equipped systems can be used to play and compare several uncompressed video formats against each other to find quality levels in several scenarios. Play multiple formats in a side-by-side to determine quality that is acceptable for both original format quality and downstream encoded video quality. Play 4K versus HD formats to find a known quality setting for encoding HD content that is upconverted to 4K at the TV panel. Decide if a known quality video applied to a processing device is creating acceptable quality on a similar size or same display type across multiple formats. Record or File Import Your A/V Test Sequence or use a pre-loaded one. Play the test sequence through encoding to a file, repeat ingest from the File Importer. Apply alignment procedures to each sequence and its respective source material. View the results in single output mode for an understanding processed video quality in each format. Repeat viewing of processed versions comparing in side-by-side to the source material to decide quality level required in each format. View processed versions compared between formats and monitors connected to each output for subjective quality differences. Comparison playback in Y’CbCr via HDSDI in multiple formats is supported to each system’s individual capacity. Video Clarity, Inc. is a leading provider of video quality measurement and video analysis systems. Products include RTM for video monitoring and automatic fault recording for before and after content is put to air and ClearView systems, video quality analyzers with extensive visual analysis capabilities and audio / video quality measurements. 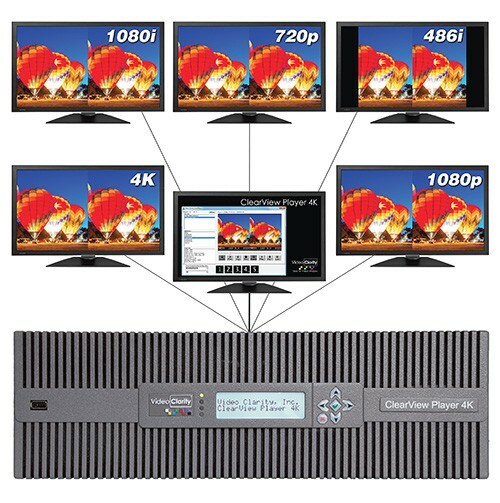 Additionally, the ClearView Player and Venue Player line provide a reliable uncompressed video server solution for an engineering lab environment. All systems are offered with automated test routines to improve customer productivity and time to market with a quality product or service.